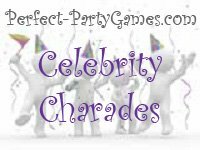 Summary: Celebrity Charades is where you make fun of famous celebrity moments from the past year. Find pictures of celebrities doing what they do naturally, which is usually something outrageous. Cut them out and glue them to a piece of either construction paper or cardstock. Fold the pictures in half and place in a bowl. Divide into teams. The first team member from one team picks a picture from the bowl. They must act out the celebrity and what they did that year from the picture. The rest of that team has three minutes to guess what event took place. If they can't, then the other team has a chance to steal. The team that can complete the most rounds with the right answers, wins.